Wataynikaneyap Power is moving forward with its power transmission project. 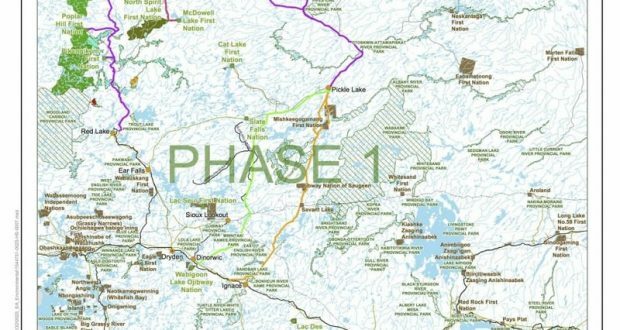 The $1.6-billion Wataynikaneyap Power Transmission Project approved four proponents to bid on the construction of its 1,800 kilometres of transmission lines that will run across northwestern Ontario . The construction means 17 remote First Nations communities will be connected to the provincial power grid for the first time. Engineering, procurement and construction (EPC) packages outlining the details for Phases 1 and 2 will now be sent to the four contractors. In a statement Watay said project engineer Hatch would release the project’s full request for proposals (RFP) documents. “The announcement of the pre-qualified proponents is the next step for this exciting project,” said Margaret Kenequanash, CEO of Wataynikaneyap Power, in the release. Wataynikaneyap Power is a licensed transmission project company jointly owned by 22 First Nations communities. Watay owns a 51 per cent stake in the transmission project, while Fortis Ontario holds the remaining 49 per cent and acts as project manager. Last March, the provincial and federal governments announced $1.6 billion in funding for the project. The funding framework allows for a viable transmission business with First Nations and Fortis Inc. participating as the equity investors. Once connected, it will eliminate the affected communities reliance on diesel fuel for power, resulting in reducing costs and lessening the negative environmental impact, while enhancing residents’ health and safety, and improving opportunities for economic development.